While PHP is definitely more powerful than HTML, it is also more vulnerable. As an example, let’s say we have an input form on our website, which allows users to create a username for our website. Then after the user is registered, we will display the users name on the page. Let’s steps through this with both an innocent users, and a nefarious user. First, our innocent user goes to our registration page, and creates their username. The data entered into the input form would be inserted into our MySQL database. Notice this form posts the data to the insert.php page. The insert.php page has the following code, which inserts the form data into MySQL, and then redirects back to the welcome.php page. 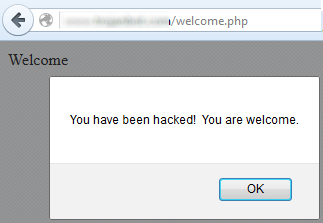 The welcome.php page displays the username. Fortunately, these types of attacks are known, and PHP has some variables to prevent these types of attacks. Following this example, we could append the htmlspecialchars code to the insert.php page. This is only scratching the surface of security. As an example, following are some other very useful features of PHP to prevent malicious users from compromising our MySQL database.